Good news for CS-Cart 4 owners. 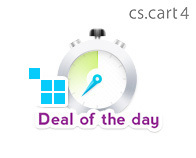 We are pleased to inform you that Deal of the day module is now compatible with CS-Cart 4. Another good thing is that a new vertical theme has been added. In this way there are four vertical themes in the module which you can place in a row. We are trying to improve our service that’s why we have made video tutorials for the cs-cart add-on. This tutorials will show you how to work with the module properly, the basic setup, how to add a block via the block manager, how to create several blocks with the module on the same page and the main one you will see all the themes in action. This video is available for both versions of the engine – for CS-Cart 3 and for CS-Cart 4. We are sure that our video tutorials will help you with setup and will also help you to get the big picture of the cs-cart plugin, to understand how it works. Below you can find video list that is also available on the product page. This entry was posted in CS-Cart addons and tagged cs-cart addons, cs-cart deal of the day, cs-cart deals, cs-cart offer countdown, cs-cart special offer. Bookmark the permalink.